Lucy’s Lab kicked off with Nuts About Science and Solids, Liquids, Guess Who’s Got Gas? in August 2017, and we’re back with Lucy’s latest adventure. If you haven’t heard of the chapter book series from IRA Children’s Book Award-winner, Michelle Houts, Lucy’s Lab, it draws on STEM themes and is aligned with curriculum guidelines to bring a love of science to young readers, inspiring them to start their own labs and explore their world. 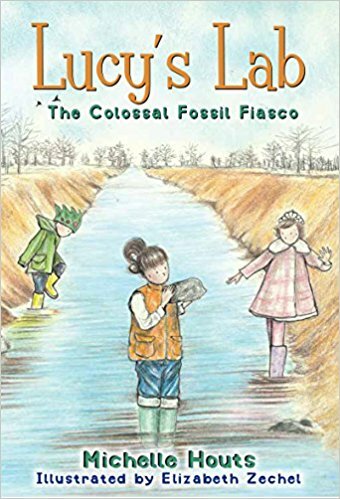 Lucy’s Lab is now on book three and it’s all about fossils! Lucy accidentally overhears her parents talking about the family getting a second pet. But what pet should they get? At school, Lucy’s class is learning about fossils and the plants and animals that left them behind. One afternoon, Lucy finds a special rock, and Miss Flippo gets very excited! But when Lucy’s precious fossil goes missing, everyone in Room 2C is a suspect. . . . This book is a girl-driven, school-based series—a perfect complement to Magic Treehouse—and perfect to give your budding scientist. About the Author: Michelle Houts is the award-winning author of several middle-grade novels, picture books, and biographies for young readers including Winterfrost, which was a 2014 Bank Street Best Book and Junior Library Guild selection, and The Beef Princess of Practical County, which was awarded the 2010 IRA Children’s Book Award. She lives, works, and plays on a farm in western Ohio, where she is restoring a one-room schoolhouse. While in second grade, she begged her parents for a chemistry kit, but wasn’t quite sure what to do when she actually got it. Lucy’s Lab allows her to be the scientist she always wanted to be. About the Illustrator: Elizabeth Zechel is an illustrator and author of the children’s book Is There a Mouse in the Baby’s Room. Her illustrations appear in books such as Wordbirds by Liesl Schillinger , The Little General and the Giant Snowflake by Matthea Harvey, and cookbooks such as Bubby’s Homemade Pies by Jen Bervin and Ron Silver, as well as a variety of magazine and literary journals. She lives in Brooklyn, NY where she teaches Kindergarten. ← Turn up the heat on your artistic abilities this summer with new The Quarto Group titles!